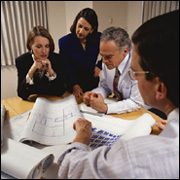 TriStar ensures every project has a Blueprint for Success by employing its New Business Development Matrix. TriStar's New Business Matrix is the basis from which all training, scripting and processes are developed. It is unique to each client and ensures that the objectives for each project are met. TriStar functions as an outsourced inside sales department and provides the expertise for everything from basic lead generation to servicing prospects through the closing process. TriStar generates its notes in a Building Block Fashion so that its clients clearly understand the history of each call and the foundation that has been laid for future contact.